PizzaFire has closed in TOWN Brookhaven. The quick serve pizza restaurant was the first Atlanta area location of the Medina, Ohio based franchise. PizzaFire in TOWN Brookhaven opened this past June in place of Treza, a similar quick serve pizza eatery. At the time of the opening, there were plans for at least one other PizzaFire, a corporately owned location in Roswell. That Roswell location never opened and it was later removed from the "coming soon" page on the restaurant's website. Signage posted to the restaurant's front door indicates that Sunday was the pizzeria's last day as PizzaFire. The signage, which calls the closure "temporary," goes on to announce that the eatery will reopen "soon" as Amore Cucina & Bar. 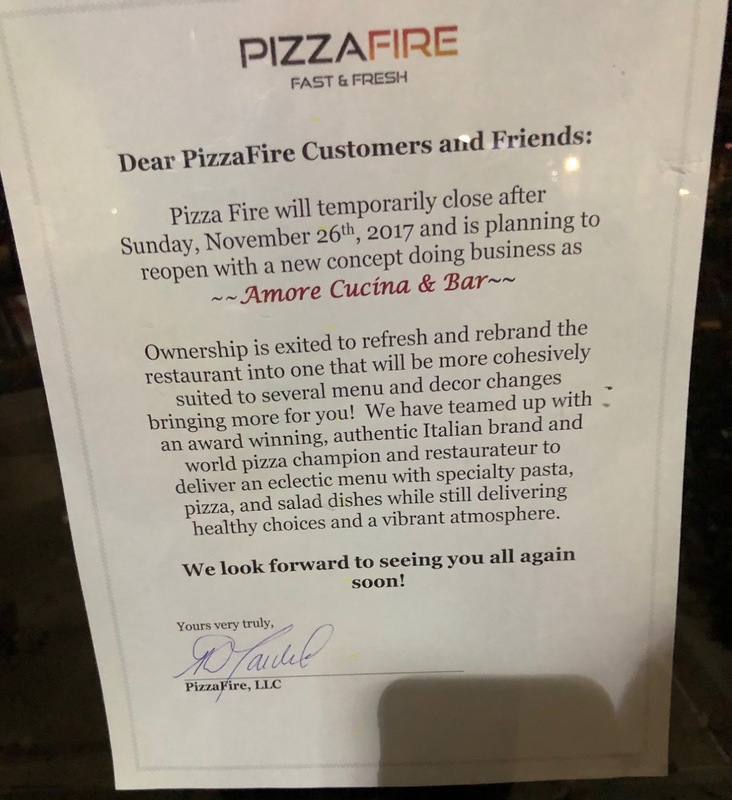 The notice further describes the new concept as a "team up" between the owners of [Atlanta] PizzaFire LLC [franchisee Daniyar Bekenov] and "an award winning, authentic Italian brand and world pizza champion and restauranteur." While ToNeTo Atlanta has thus far been unable to confirm it, the partner's description combined with the new name leads us to deduce that chef/restauranteur Bruno DiFabio is the one partnering with Benknov in the rebranding of the restaurant. DiFabio opened his first, and currently only Amore Cecina & Bar in Stamford, Connecticut in January 2015. DiFabio is a six-time World Pizza Champion who has frequently appeared on the Food Network. "Ownership is exited to refresh and rebrand the restaurant into one that will be more cohesively suited to several menu and decor changes bringing more for you! We have teamed up with an award winning, authentic Italian brand and world pizza champion and restauranteur to deliver an eclectic menu with speciality pasta, pizza, and salad dished while delivering healthy choices and a vibrant atmosphere." Unlike PizzaFire, Amore is a full-service restaurant and even offers Sunday brunch which could make it a formidable competitor to newcomer Hobnob. Do you think Amore will succeed? Why do you think PizzaFire and Treza failed? Do you think TOWN Brookhaven is cursed? You must get so excited when a restaurant fails at Town Brookhaven. It's like you live to hate it. Pizza Fire was good, unfortunately for whatever reason (demographic, location, parking, lack of marketing) it never took off. We loved it. Hob Nob, on the other hand, is foul, the servers are rude, the food is bad, and we will never go back. Yuck. I looked at opening a fast casual there a year after Treza closed... It's a huge space that's on the very expensive end of the rent spectrum. I couldn't see enough people coming in to ever get past the rent in a fast casual setup. That and poor parking access made us run away quickly! Anon 745 stated that pizza fire was good - my response is you don’t know pizza....! Seriously though if I was a restaurant owner I would never setup shop at Town Brookhaven. It's one of the worst locations ever. Extremely car centric with very limited parking(and NO I am not including Publix b/c no one is going to park there and then walk). Pizza was decent, but the whole self serve ordering process (if you want alcoholic drinks) was way too cumbersome. Also no atmosphere to speak of. Hob Nob has mediocre food but a much better atmosphere, especially the bar area and patio. Sounds like the new concept makes much more sense. HN will definitely make it IMO. I went once on a weekday around 7pm to try it out a few months ago. Noticed right away that I was the only customer in the entire store. Pizza was kinda bland and just not good in general. Whole experience made me feel like I was going to the subway version of a pizza place. With so many better pizza options in the area not at all shocked they went out of business. Excited to try the new one though!